Digital Thermo-Anemometer for wind Speedy & temperature measurement. The temperature display can be in Celsius or Fahrenheit. Possibility of different wind speed measurement units: m/s, ft/min, knots, km/hr, mph. 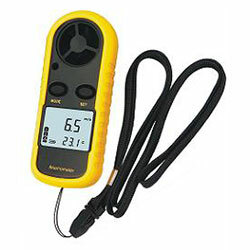 Wisemann Klein (WK)is leader in the introduction of innovative products with the latest technology and best quality.We specialize in thermometers, tactical torches, high quality binoculars and measuring instruments. Our goal is to permanently introduce into the market the most innovative products afordable to everyone. Get the best quality professional products at best price. To be informed of the last new products in the market. Save more than 50% off from your current supplier. We have special prices for distributors. Want to be our dealer?